Invest Openly: My Open Review Of "16 Asian Growth Stocks That Made Up To 1,813.6% In ROI"
My Open Review Of "16 Asian Growth Stocks That Made Up To 1,813.6% In ROI"
As indicated in my earlier post, I've requested for the free book of "16 Asian Growth Stocks That Made Up To 1,813.6% In ROI" from The Fifth Person and I've since received it the next day. Strictly speaking, it is not a book, it is just a compilation of 16 case studies of stocks (I believed these are also some of the selected stocks that the authors have profited from). To be frank, I don't know how and where to start (to give review), as per my indication earlier, it is more like a compilation of case studies and hence there are no specific topics or principles being covered in the "book". In this super thin compilation (there is no page numbering and don't bother to count), I guess the only highlight is their highlights of the 16 businesses' success factors/elements (for example via acquisition of highly profitable business, strong brand equity etc..). Of course, these are very company specific (and from hindsight), hence they would not be applicable to any other businesses (now or future). I am not sure how true is it that The Fifth Person is intended to sell it for USD19.95 in the future but personally think that the content is too scanty and the value of it is way below this price ;-) Having said that, I have no regret to pay for the postage fee to get it as it is a form to support local financial literacy energy and hope that they do a better job in the future! Look like can't make it to NLB. I can't borrow. Is the 16 stocks those they are holding in their portfolio? The fifth person looks credible in their review. B : there is no indication as to whether they held/holding these companies but personally think that they must have at least hold a few of them. Ya, I quite like their articles and analysis from their site. Can list out the 16 companies? 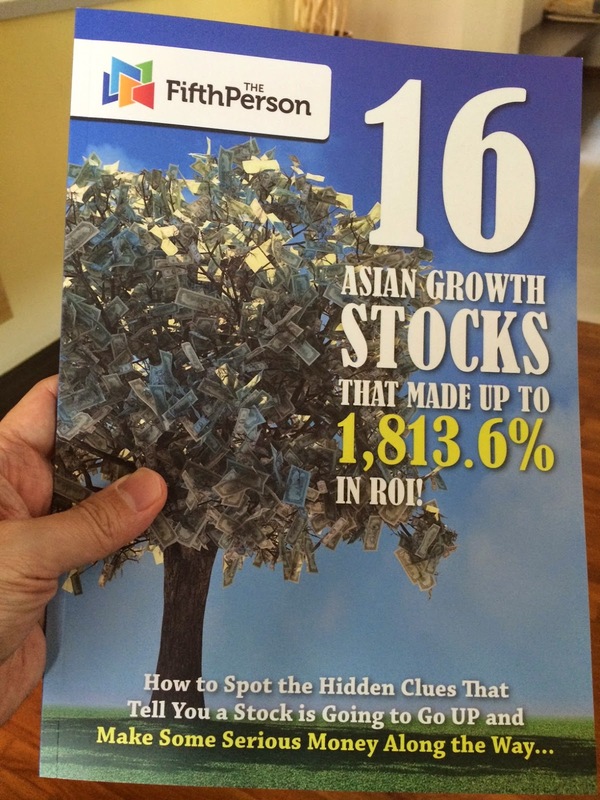 Thanks for supporting us and getting a copy of 16 Asian Stocks. You're right about the book -- it is very thin (definitely can’t make it to NLB!) because we wanted to drill down and focus on the one or two catalysts that ignite a company’s business growth and, eventually, its share price. So you won't find any fluff or lengthy analysis, all you have are the exact reasons why these 16 companies grew the way they did. We did intend to sell the booklet for USD19.95 moving forward but now we plan to simply discontinue sales once the current print run ends. In any case, we hope 16 Asian Stocks has given you some new investment insights and thanks again for grabbing a copy. Thank you for the review and continue to check us on The Fifth Person!